This product worth 359 loyalty points. 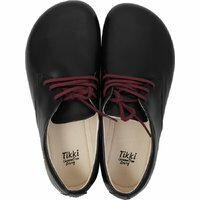 A new line of Tikki shoes, called ROOTS, has shaped up following intensive testing and experience accumulated during these last years. 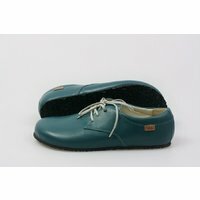 Shape especially thought out to please your feet and satisfy the demands of the Barefoot concept. Just like everything flowers only in contact with the earth, your feet are roots that offer balance and stability. ROOTS from Tikki are the essence for a harmonious development of the feet, here to remind you how satisfying it is to walk as nature intended. 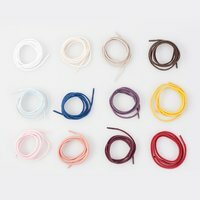 The shoe last for our new ROOTS line is completely respectful to the anatomical shape of the foot, allows the toes to wiggle as they please, while the shoelace is excellent for adjusting the shoe to a perfect fit. The foam padded collar offers you comfort from the very first wear. 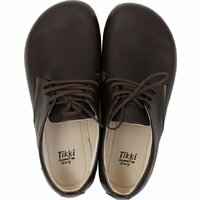 ROOTS from Tikki Shoes are suitable for (nearly) any type of foot. Narrow heel? 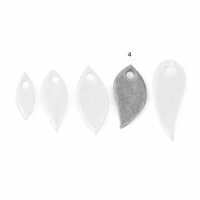 The shape is specifically designed to accommodate. Low or high instep? Adjusting the shoe is simple and comfortable. Wide feet? 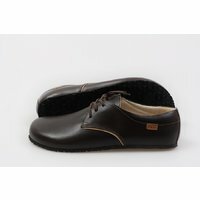 We then recommend you, and also ‘owners’ of medium sized feet, try the ROOTS line: shoes made to offer maximum space for the toes. Without losing grip of the foot! Because it has earned our trust a long time ago, we added to our new line the well-known, light, comfortable and very flexible 6mm Vibram Supernewflex sole. 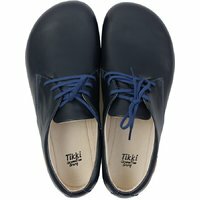 For the connoisseurs, the Tikki Crafters specify that the classical shoe lasting technique does not allow adding an ultra-flexible insole, so while the ROOTS shoes are flexible in terms of length (ie the sole will easily bend with your foot as you walk), they are less flexible width-ways. 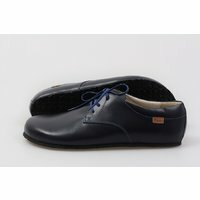 In theory more Minimalist than Barefoot, the ROOTS line has in fact an excellent barefoot walk feel, guaranteed by the shape, flexibility and unique comfort of the shoes. 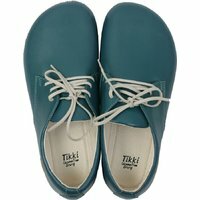 Give your feet the liberty to thank you for choosing Tikki Shoes ROOTS. You can make the contour of your foot and then measure the width at the ball of the foot (as we show in the size guide), but do take into consideration that the actual width is much bigger as the sides of the shoes are quite spacious and cannot be measured 2D. You can easilly add up to 0.4mm extra width space (for example, if the shoe width is 10cm, a foot of 10.2 cm will feel very comfortable inside). Therefore, we advise you to RATHER measure the CIRCUMFERENCE, exactly at the ball of the foot, and compare it to our circumference - if it's less, or equal, than the shoes will be ok in width (the leather will also stretch a little bit after a few wears). Note: If you already have our adult sandals, consider this - in case there is an extra space of cca 1cm in the sandals, and you have a normal-medium wide foot, then you should choose the same size in shoes (the width is about the same). If there is less than 1cm in sandals, and they fit just rigth, or if you fill the entire width of the soles, then we advise you to size up.